An essential part of the Montessori experience, the term ‘prepared environment’ refers to a classroom that contains all of the elements a young child needs to naturally respond to their individual desire to explore and learn. The environment provides the opportunity to take from the surrounding materials, which are child-sized and designed in a meaningful way, and aid the child in their discovery of the world around them. This prepared classroom environment differs from the traditional classrooms as it is a multi-aged environment. Three to six year olds work and learn from each other as they advance at their own pace. This also builds a sense of family and community, creating opportunities for the younger child to learn from their older classmates while it builds confidence and self esteem in the older children as they share their knowledge with their younger classmates. So essentially this prepared environment becomes like a family atmosphere where a child feels safe and comfortable. Along with the prepared environment are the distinct areas of the classroom. Each of the areas deal with certain skills which as the children explore them all relate back to each other. There are five main areas in a Montessori Classroom: Sensorial, Language, Mathematics, Everyday Living/Practical Life and Geography/Culture. The practical life area helps a child explore and participate in hands on activities that teaches the child how to function in the environment around them. Exercises such as pouring, spooning, sorting, food prep, care of self, care of the classroom environment and grace and courtesy are included in their daily lives. 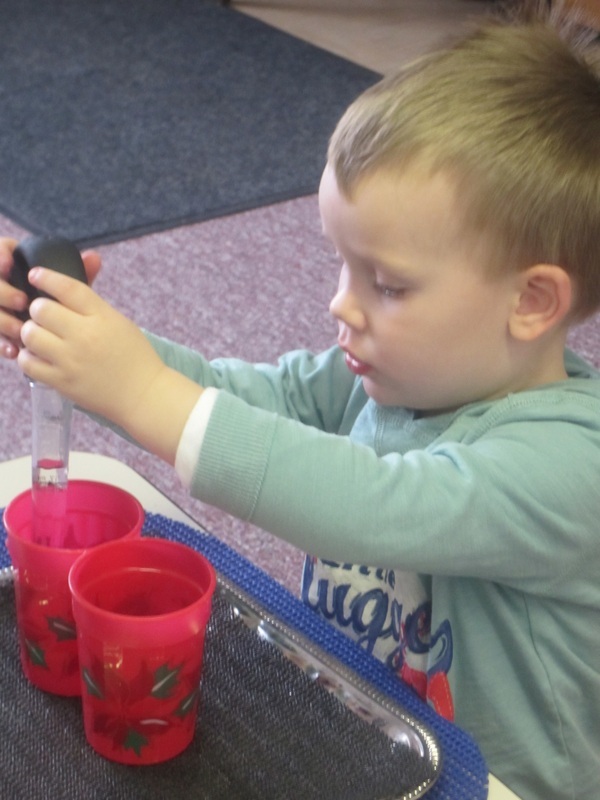 The children learn to become independent and confident in their abilities while building their concentration and focus as the child learns simple everyday tasks. In the beginning the child explores quantity and symbols all in a concrete manner. Sequential materials allow ‘hands on’ exploration of shapes, relationships, dimensions and amounts. 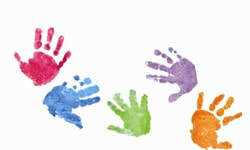 The child’s ability to touch a ‘one’ or ‘hundred’ helps them to internalize the process of the mathematical concept. The sensorial work carries over into the math area allowing them to begin this concrete exploration and move at their own pace into more abstract concepts. This area encompasses several smaller areas both physical and intellectual. Montessori looks at geography and culture together, working to bring awareness to the child of their place in the universe. Geography begins with the globe and works down through the physical aspects of the earth. Nature exploration brings experiences in biology, botany and zoology. The children also learn about the people and cultures of our human family, including exploration of our similarities and differences. The art and music included in this area, give the children an opportunity to enjoy creative activities. Montessori exposes children to the sounds letters make as they once again use their senses and movement to physically trace the sandpaper letters through the process. 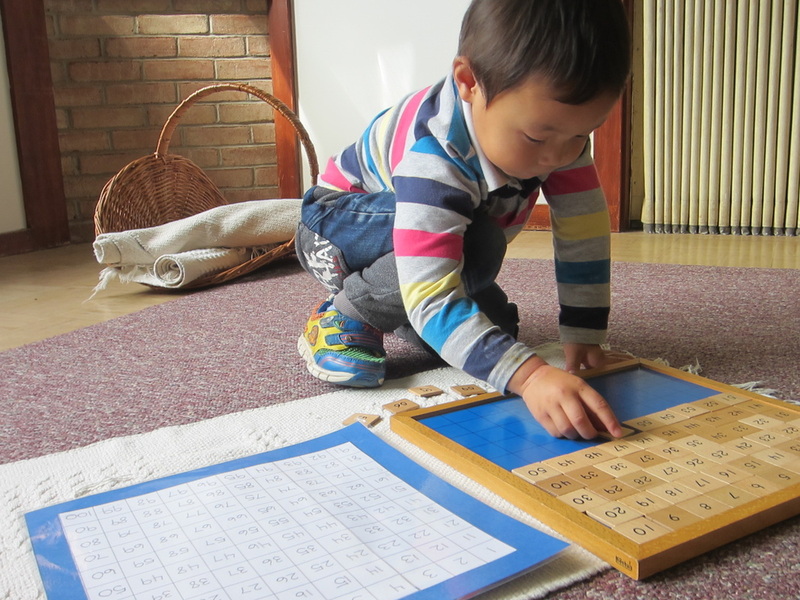 Once they have learned to discriminate a few individual sounds, they begin putting sounds together working forward through this natural progression of learning to read. A very individual approach, which allows the child to develop their reading skills and vocabulary at their own pace. Also included in the Language area are the children’s writing skills, which themselves tie back to Everyday Living where the explorations there help develop their small motor skills and finger strength.